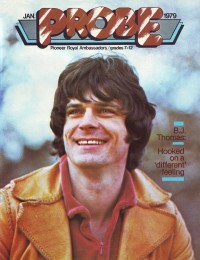 Nov 1978 in Campus Life "Spotlight: B. J. Thomas"
Dec 1978 in CCM "B. J. Thomas"
Aug 1980 in CCM "B. J. Thomas"
Dec 1981 in CCM "People & Places: B. J. By The Beautiful Sea"
Jul 1982 in Charisma "Charisma Music's Top 100"
Oct 1982 in CCM "Cool Crowds Fuel Hot Tempers"
Jul 1983 in CCM "B. J. Thomas"
Aug 1984 in The Wittenburg Door "Loser of the Month: B.J. and the D.J." Jul 1998 in CCM "Don't You Forget About Me: B. J. Thomas"
Best Inspirational Performance: "Home Where I Belong"
Best Inspirational Performance: "Happy Man"
Best Inspirational Performance: "You Gave Me Love (When Nobody Gave Me A Prayer)"
Best Inspirational Performance: "Amazing Grace"
1 article credited in Christian Herald: 1979. 1 article credited in The Saturday Evening Post: 1979.